No problems for the extra work so far, these were only minor changes on my end (literally a few lines of code). I'll be slower on more difficult items. Don't forget to look after your eyes! Well, i'm using this programs to translate the game. You can now give this a go using test builds below. I won't publish these to the Live Builds page as they're only intended to test this specific change. Test builds below will be removed once available on Live Builds. For anyone coming in fresh, this change is for quest scripts only at this time. Download and unzip build for your system. Download replacement FONT0003.FNT file by delvisomanda here. Go to DaggerfallUnity_Data\StreamingAssets\Fonts and replace FONT0003.FNT with the file downloaded in previous step. Go to DaggerfallUnity_Data\StreamingAssets\Quests and open S0000999.txt in a good text editor like Notepad++. You might need to convert file to UTF-8 before making any edits. In Notepad++ this is Encoding > Convert to UTF-8. I think the quest files from builds are already in UTF-8 format, but just keep this in mind for new quest scripts that UTF-8 is the best format. Make some edits to a quest, such as inserting ¡¿áéíóúñ!? to Message 1010 in quest S0000999 above. Open game and use console to "startquest s0000999" for example then test text. When distributing your changes to others, give them your replacement quest scripts and font files and tell them where to unzip in StreamingAssets. Let me know how you go with it. I don't expect miracles for a first-pass solution, but hopefully it will help you start making progress. I'll do what I can to solve any problems in a timely manner. If you guys need any help editing quests or understanding the format, Jay_H is a straight up expert in this field. Please feel free to start a Spanish translation thread somewhere in the modding forums. Note: Quest save/load should also work OK with these changes. Don't forget that previously saved quests are read from save data (not from source). You will need to clear quests and use "startquest xxxxxxxx" again to get fresh changes from modified quest script. Jay should be able to assist with this. Interkarma hears about the problem in the morning, has a new build out in the afternoon... I know it's simpler than it sounds but really! Interkarma wrote: If you guys need any help editing quests or understanding the format, Jay_H is a straight up expert in this field. Please feel free to start a Spanish translation thread somewhere in the modding forums. It works! But the fonts need more work, so I'll have to keep modifying them. Yay! Looks like a great start. Good luck with the other changes. At least once pixel font is perfect, you won't need to worry about it any more. Cool, I thought they would be UTF-8 from builds. You would then just need to check this when creating whole new quest scripts from scratch. The framework will do its best to convert encoding from source text to something Daggerfall's pixel fonts can use, but it won't always succeed. 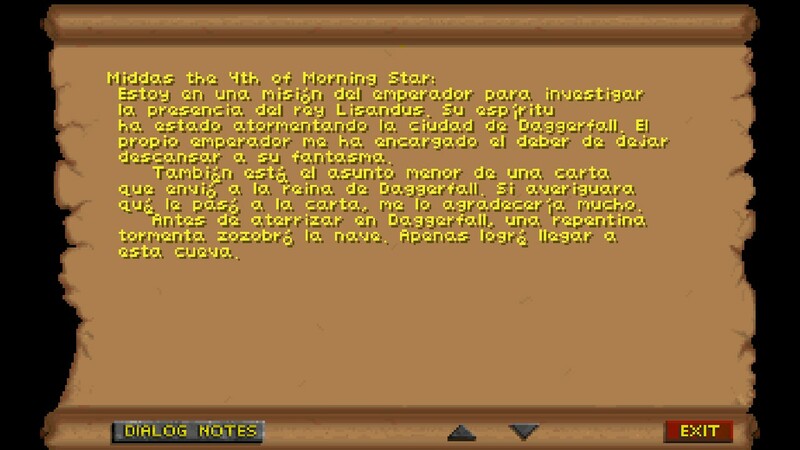 UTF-8 (text editor) to Latin-1 (Daggerfall UI) should be a good mix most of the time however.